Sterling silver oval locket (.925) with an 18" curb chain. 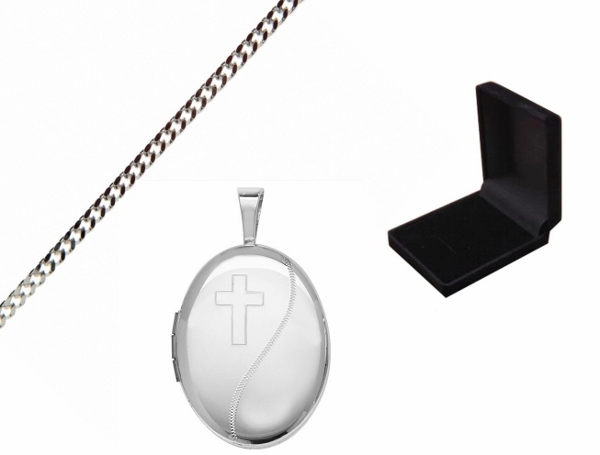 The locket measures 16mm, has a cross design and comes complete in a black gift box. Please limit your engraving to a name or initials as the engraving area is small. Your engraving will be done on the reverse of the locket. If you supply us with more than the limit this will delay the dispatch of your order. The locket makes a perfect Birthday, Anniversary, Mother's Day, Valentine's Day and Christmas present.